In just three years’ time, the World will have lost two-thirds of all wild animals. This amazing statistic from The Living Planet Index claims, the number of wild animals living on Earth is set to fall by two-thirds by 2020, according to a new report, part of a mass extinction that is destroying the natural world upon which humanity depends. The analysis, the most comprehensive to date, indicates that animal populations plummeted by 58% between 1970 and 2012, with losses on track to reach 67% by 2020, full story here. In the 12 months between 2016 and 2017 nearly 4 million kangaroos have died in Australia from a mystery disease. Millions of kangaroos are being wiped out down under by a mystery disease that causes massive haemorrhages and internal bleeding. According to scientists, they have been left baffled as to why the kangaroo population is being decimated. 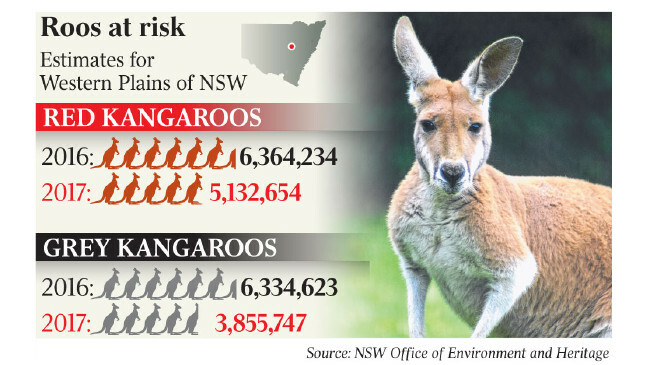 Both red and grey varieties are dying from the mysterious disease which is causing the kangaroos to die from ­hemorrhaging and internal bleeding around the joints. According to The Daily Mail, Greys in the state dropped to 3.85 million from 6.33 million, while reds dropped by 1.2 million to 5.13 million. Here’s your answer to the “mysterious” kangaroo apocalypse.